Whenever there’s something I want in my life that I don’t already have, I look at my plans. If I don’t have a plan to make it happen, I know it won’t happen. Recently, I decided to rebrand my courses, so I put plans on my calendar to make it happen. I know for sure it’ll get done in the next few months because I have everything planned out. But I also want to lose a few pounds…and I have no plans to make this happen! You can bet that the courses will be rebranded in a few months, but the weight will be the same. The difference is I have a plan for one and not the other. Planning is a huge part of accomplishing anything. It’s right up there with massive action. You set the goal, create the plan, then take massive action until you achieve it. Today, I want to show you what that means down to the day to day level. I want to show you how to plan your day. You have to start big picture. That’s the key. When you start big picture and break it down into smaller actions and calendar entries, then you will accomplish your goals and design the life you want. There’s no point in planning your day just to plan your day. You need to know what the end goal is and what you value most, to plan your day the right way. Once you have your big picture goals in mind, you need to break that down and plan your day so your goals actually happen. If you want to listen instead of read, here’s the podcast episode that goes along with this post — Best Planning Practices. The first step is to choose the right planning tool. Meaning, choose one tool. Stick with it. Then create a plan that works for you. The key to success is in the plan, not the planner. That said, choose one that works for you. I’m obsessed with gCalendar for this. Here’s a look at a blank gCalendar. This is what it looks like (in week view) when you first start using it. Here is a look at my other favorite planners and journals. I also really like Asana and the Productivity Planner for my planning needs on a regular basis. Within your calendar, create separate calendars for each area of your life that you want on your calendar. 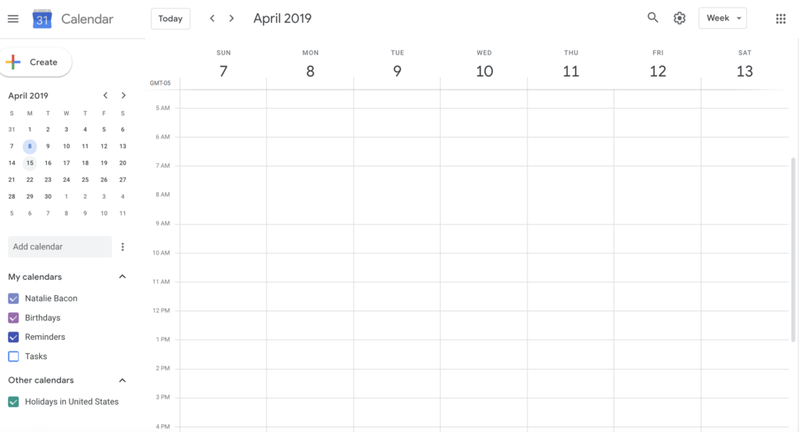 Here’s a look at the many calendars I have in gCalendar and also how easy it is to click “Create new calendar” once you’re in there. 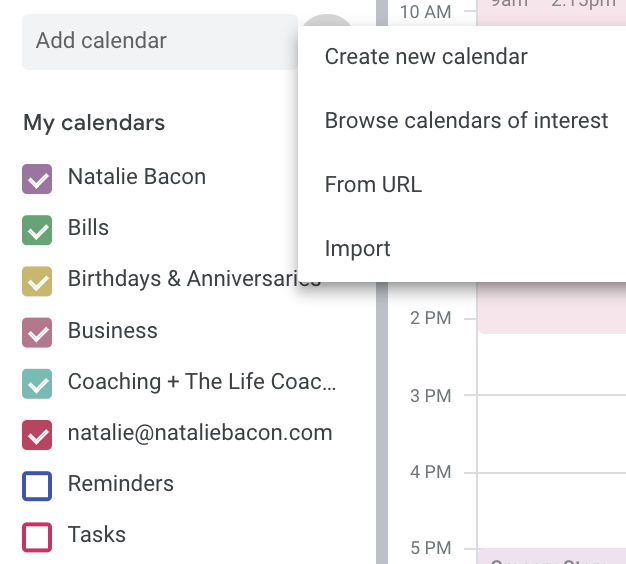 Here’s a helpful link on how to create a calendar in gCal if you haven’t done it before. I have to say that if this sounds foreign or overwhelming, it is 100% worth your time to set it up right now. It’ll help you create plans that design your future, which means you’ll be able to take massive action and accomplish all your awesome goals. On Sunday night (or Monday morning), spend at least one hour planning the upcoming week. The best way to do this is to fill in blocks of time for everything. If you’re thinking it’ll be too restrictive, the complete opposite is true. If you do it right, and include your down time, this schedule gives you more freedom. Here’s an example of a very basic calendar using gCal. I just threw this together in two minutes, but you get the idea. 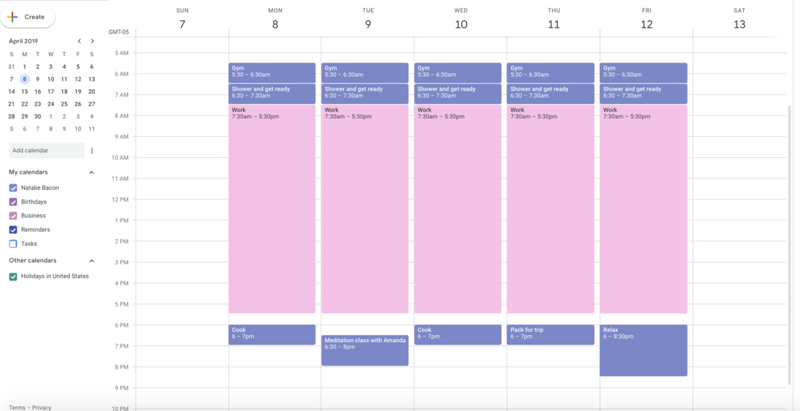 You want to color-code the type of event, and then you want to fill out the entire week. I didn’t do weekends here, but you want to include anything you have scheduled on the weekends, too. It’s not enough to plan your day. You have to actually look at your calendar and do what you say you’re going to do. For example, if I have on my calendar that I’m going to go to core power yoga at 6:15am on Tuesday, I know that means I have to go to bed at a decent hour the night before. I always keep my calendar up in front of me, too. This is a game changer. It’s in a browser tab, so I make sure I’m on time with everything I’m supposed to be doing each and every day. If you’re struggling with following through on your commitments and doing what you say you’re doing to do, that’s more of a self-love issue. You might want to listen to this episode on When You Don’t’ Feel Like It. When you plan your day right, you will have to get good at saying no to other things that come up. This means that when you’re invited to an early breakfast or and afternoon event, as tempting as it may be, you should say no. I am all about being social and having fun (especially in Chicago), but you have to put limits on it and prioritize your future. The process above is how you actually plan your day. Always put the results you want to produce on your calendar. 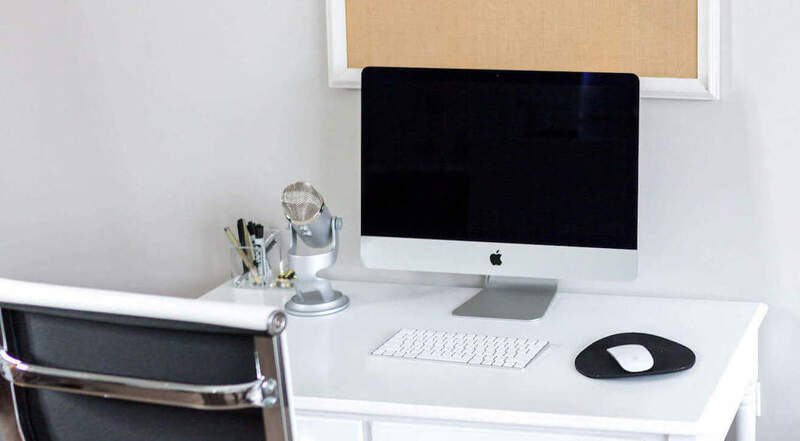 So, in the example above where it says “work,” if you have specific results you want to produce (like if you run your own business), go into the entry and add the specific results you plan to produce during your workday. Do this for each day. Give yourself enough time. Make sure that you give yourself the right amount of time for the thing that you need to do. So, even your #1 priority might not need the most time. It just needs enough time. (E.g. : If health is a #1 priority, you may only need to devote 1 hr per day to it). Turn obstacles into strategies. Whenever you feel stuck or like you’re not sure how to do what you want to do, make a list of obstacles and turn them into strategies. I don’t know why this works so well, but it does. Don’t sit in indecision. Being indecisive takes so much energy and it kills your plans. You’ll basically spin out and waste a bunch of time. It also feels really responsible and it’s not. If you struggle with making decisions quickly, listen to this podcast episode on decision making and check out this blog post on decision making. Learning how to make decisions is a skill that’s totally worth working on. Total life changer. Evaluate your plans. I’m all about a good plan, but you also have to make sure the plan is working. It’s not enough to do the plan. You have to take a look and see if it’s getting you the results you want. Give your plan time. Make sure you don’t rush it. But take enough action so that you have results you can evaluate on. The point of all this planning is so you do what you want to do and can design the future you want—not what someone else wants. If you actually know how to plan your day, and do it every day, you’ll be in a totally different place a year from now. I’m amazed at the last year. I’ve created my future and it all happened because I made the plans and took action. I get requests all the time and the turnaround is 1-2 weeks (or less). I say no, I’m booked but I have room in a few months. That’s how I make sure I prioritize my life and make sure it happens. It means there’s a little FOMO, but it’s 100% worth it. Thank you for sharing the visuals of your calendar set up! I am so visual and this was missing for me in the DYDL course, but now I get it much better. The issue for me was using ONE calendar for all that! haha! Now back to create a much better calendar all in one. Google calendar is a great tool! I didn’t start using it until I had to for my part-time job. We do so to plan programs up to six months ahead of time. I implemented the steps for my personal writing projects at home and it was worked wonders for me! Natalie, I enjoy reading your informative and inspiring articles, and thank you for the helpful tips on how to plan.